Hi Friends, you've probably noticed that the blogging world is gearing up for Fall; YAY, my favorite time of the year! 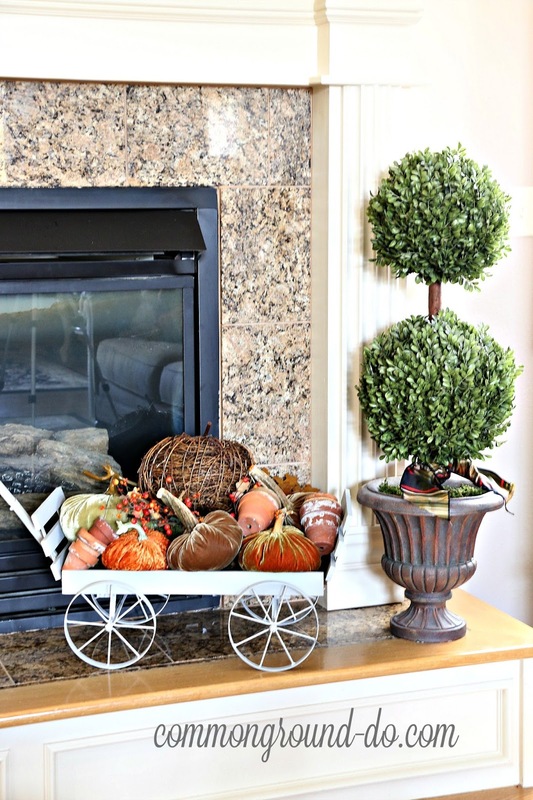 I hope you've been enjoying all the Fall Home Tours this week; so many fun ideas and inspiration for reflecting the warmth and coziness of Autumn. 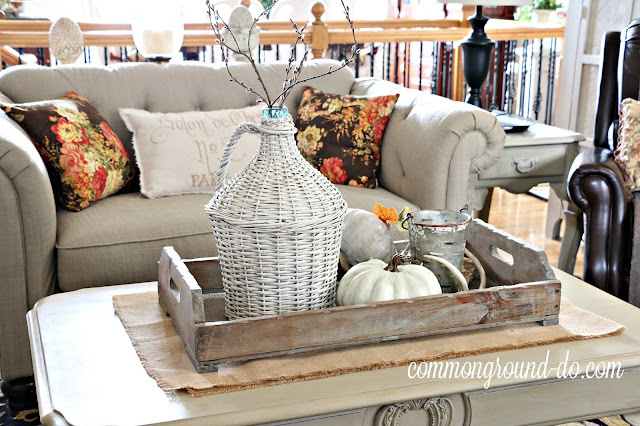 I'm excited to be a part of Marty's Fall Home Tour at A Stroll Thru Life. I started gathering elements in August so I could be ready to enjoy "Early Fall" without all the rush. 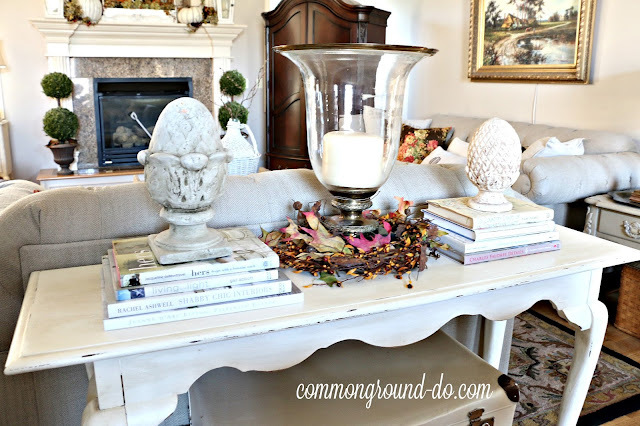 Today I'm sharing our Entry and Living Room dressed for Fall. Marty always brings together such a wonderful group of diverse bloggers. You'll find everything from Glam to Farmhouse to Vintage. I have the week's list at the end of this post, so I hope you'll enjoy visiting everyone. 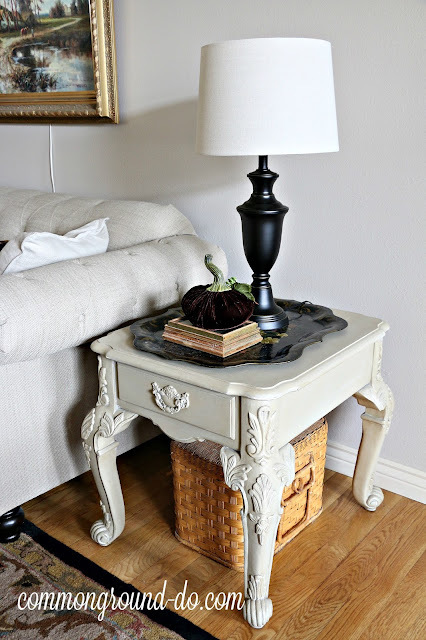 If you're coming from April's blog, House by Hoff, I'm so glad you're here. I hope you'll come by again, as I have lot's of fun this time of year. I really enjoy decorating with the colors of the Season at hand, so Fall is full of all the colors of nature in Autumn. 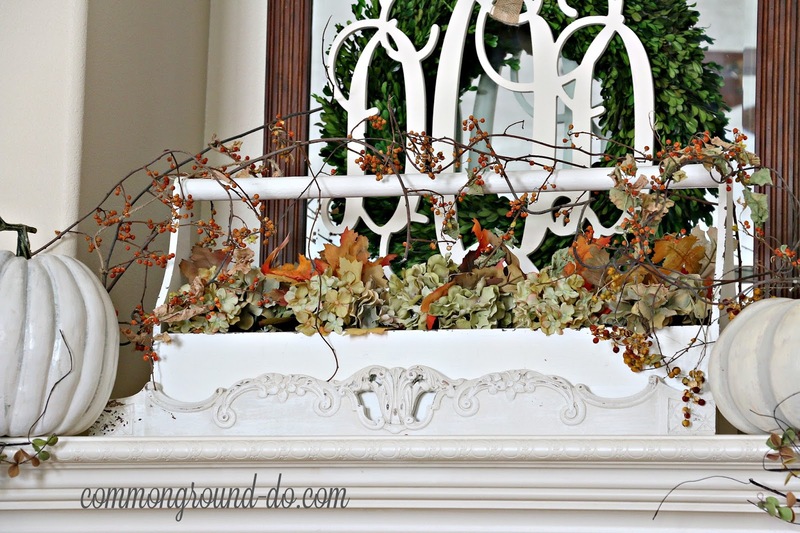 I love using golds, oranges, reds, and browns this time of year in my accessories and florals. 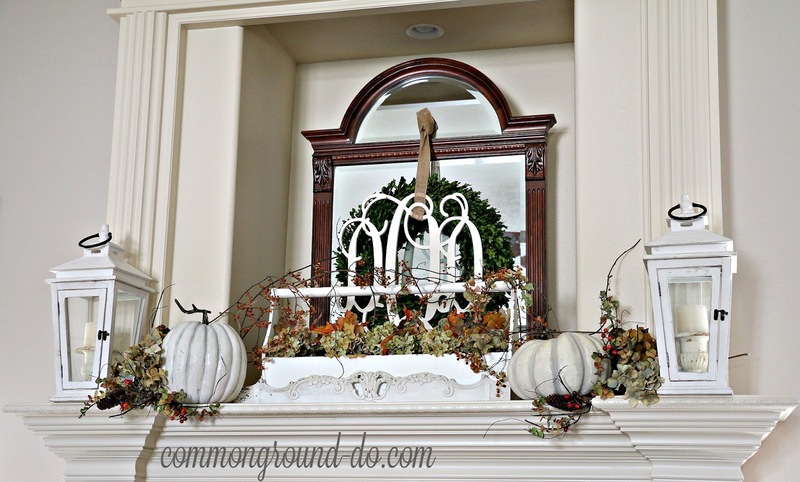 My home basically has a neutral background, so I can easily move from season to season. 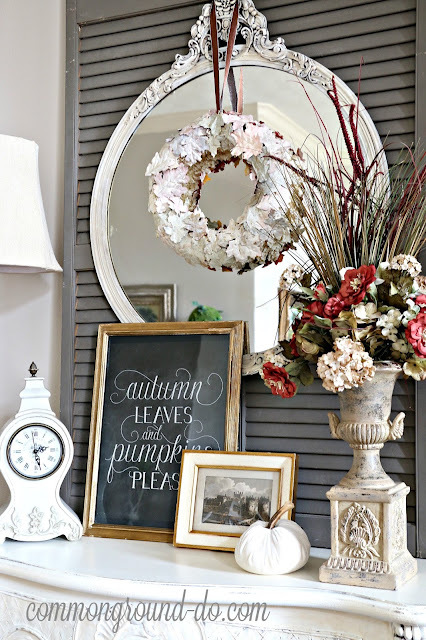 Last year I made this Painted Neutral Leaf Wreath, and it's back this year, this time it's here in the Entry. The Entry sets the mood of our homes, so I keep my vintage shutters and mirror here year round. 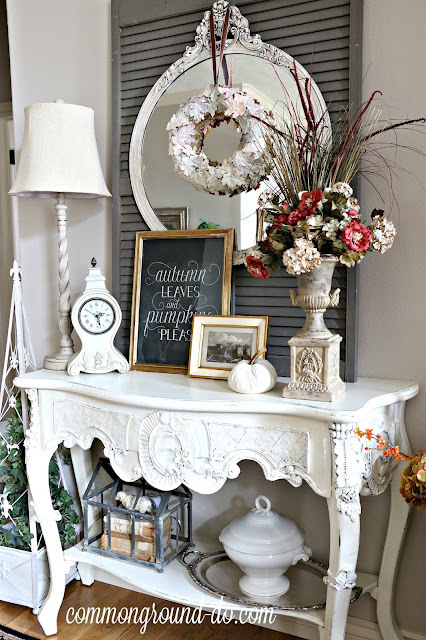 I also rotate a collection of vintage frames and prints on the console that I use to reflect the Season. 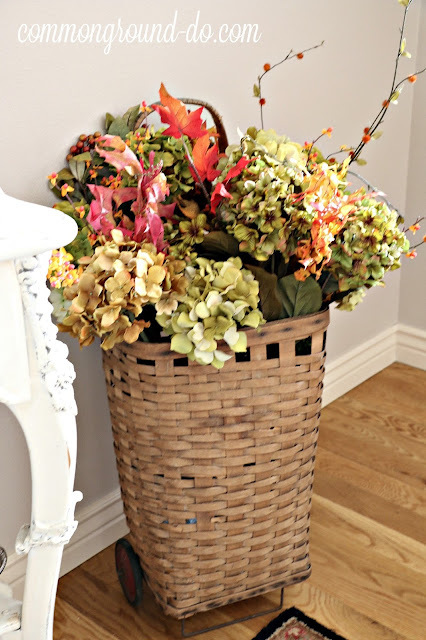 My favorite flowers to use are Hydrangeas and you'll find them no matter what the time of year. 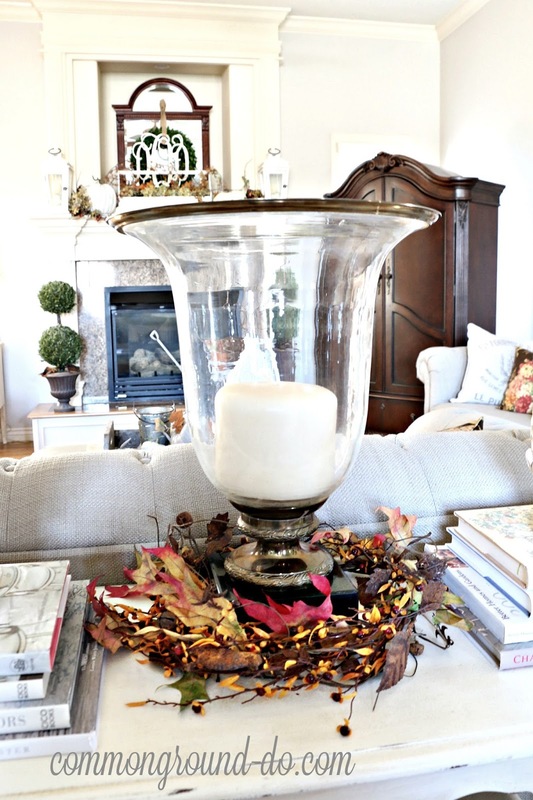 Heading into Fall I like to mix them with Sunflowers and preserved Fall Leaves. My vintage market basket is always filled with some mix of Hydrangeas and seasonal faux flowers. 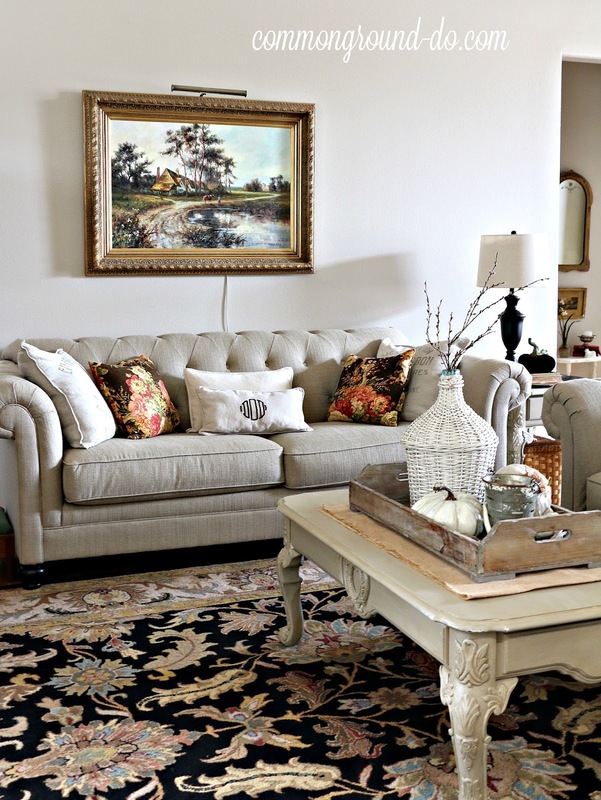 We've been in our home for almost three years, and we love the open concept rooms and high ceilings that we have here. I spent days choosing the wall color, and have ended up being so happy that the Smokey Taupe Ben Moore paint gives me a great neutral background. 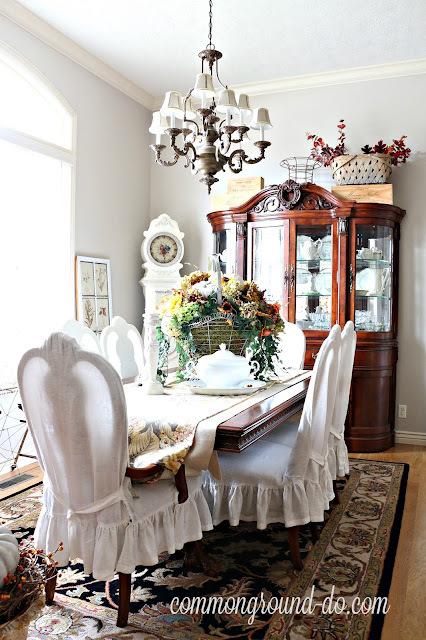 I guess English Cottage and French Country would be the decorating category that I fall into, so I gravitate to a vintage/traditional vibe. If you read my blog you'll know that my mantel is always my most difficult area to decorate. So whatever works up here, tends to stay here, with just a little seasonal tweaking. I've been using my Pottery Barn Lanterns and a vintage tote with Mason Jars filled with Seasonal Flowers. Hydrangeas and Fall Leaves show up here, too. A little French Wagon that makes the rounds is filled with Velvet and Twig Pumpkins and is setting on the hearth with a few vintage clay pots for good measure. 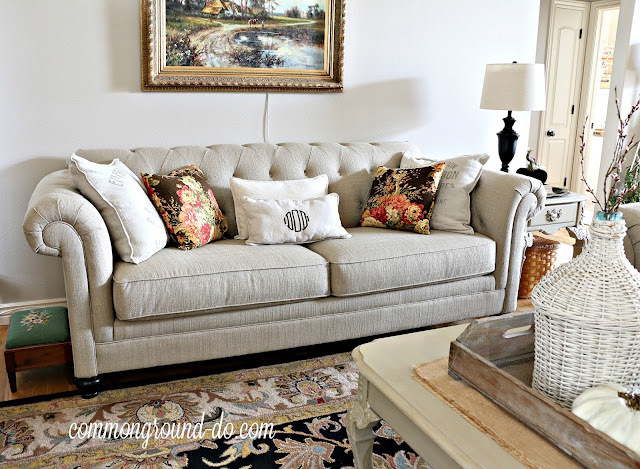 We purchased a neutral sofa and loveseat when we moved, and I really enjoy changing up the pillows each season to give them a completely different look. 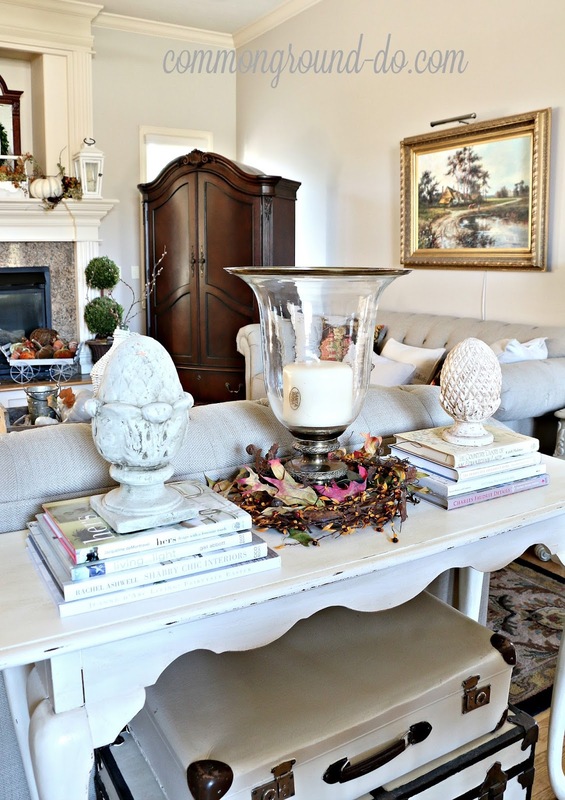 I found this vintage painted white demijohn this last summer, so it's here on the coffee table with a few antlers, faux pumpkins, and one of my Olive Bucket Candleholders. I don't really have a green thumb for indoor plants, but I do have several large Ivies, that seem to do well here. 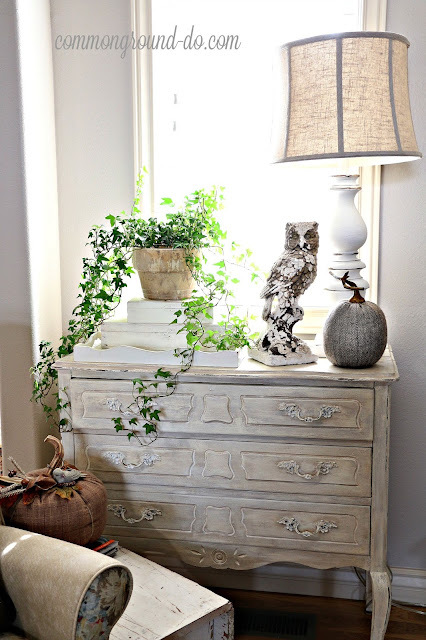 As you can see, many of my accessories and decor pieces in vignettes are well loved and worn vintage elements. I found this concrete owl last year on one of my vintage market trips. He's a fun authentic chippy white Fall piece I've really enjoyed. 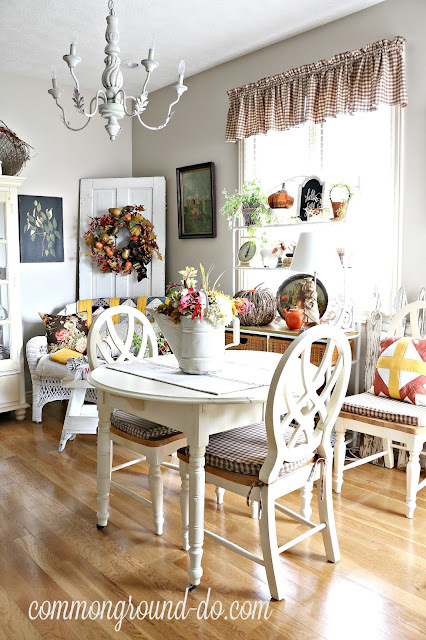 Here's a peek from the Kitchen Sitting Area and the Dining Room that I'll be sharing next Tuesday. I hope you'll come back and visit, to see the rest of my home ready for Fall. hope you'll visit and enjoy the fun. Thankyou Marty for including me in the Fall Home Tour! Now you can head on over to see Debbie at ReFresh ReStyle. Your home is gorgeous for fall! 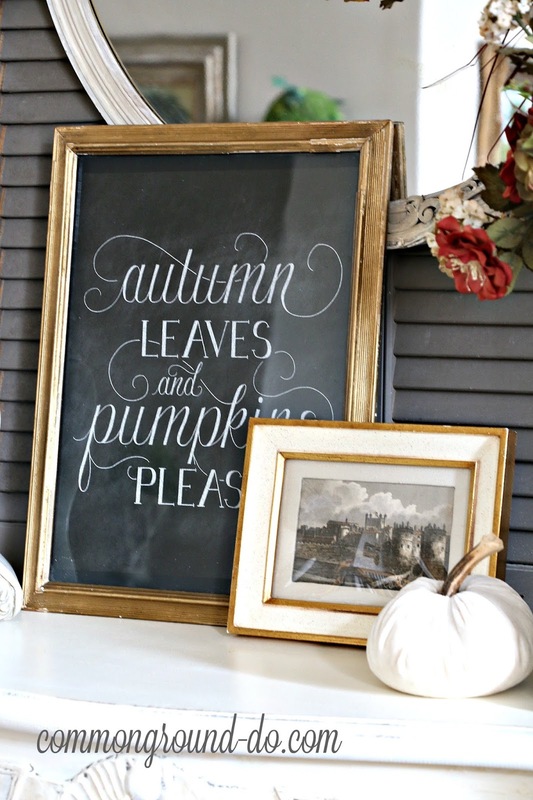 I've been holding out on putting out pumpkins, but you've put me in the mood with your muted colors. Debra is truly have a gift fror creating lovely and inspiring fall vignettes. Have a wonderful week my friend! 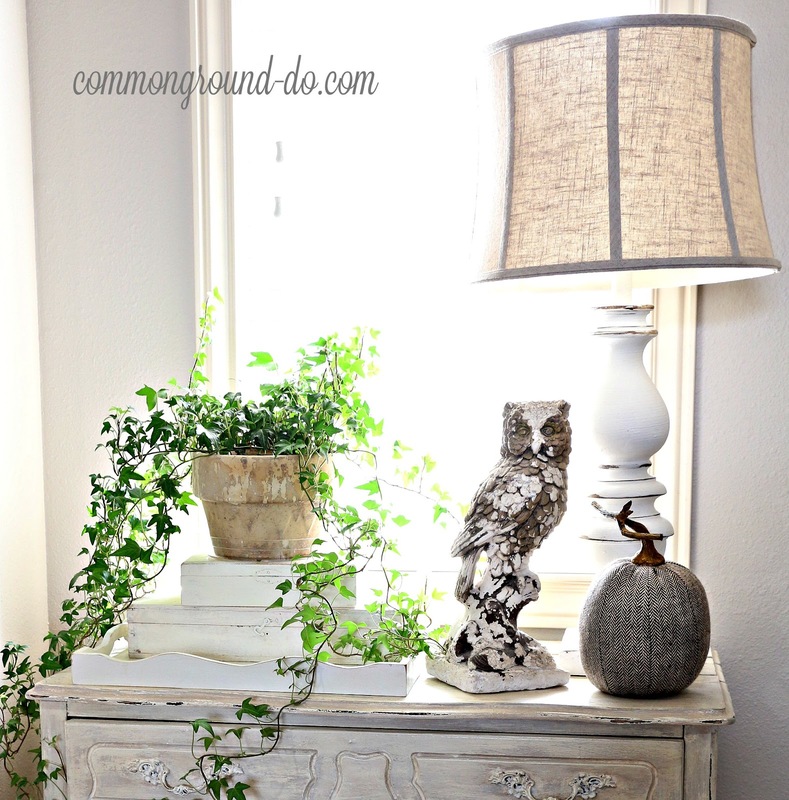 I love your pretty french chippy white touches you add around your home. Always so beautiful. Thanks so much for joining the tour. Love your home and all your vintage antique pieces!! Thanks for showing us around! 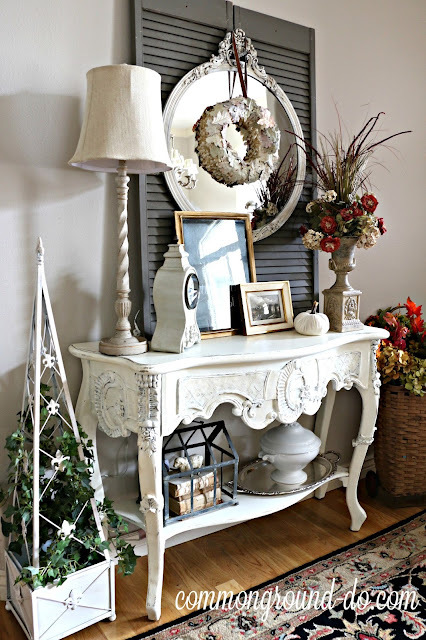 Debra - As always, your home is styled so beautifully! 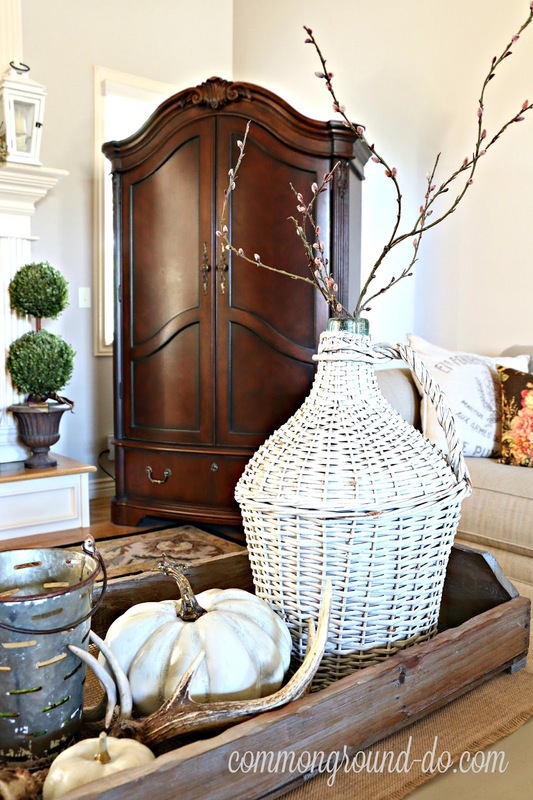 I love the colors you chose and that white demijohn was quite the find!! 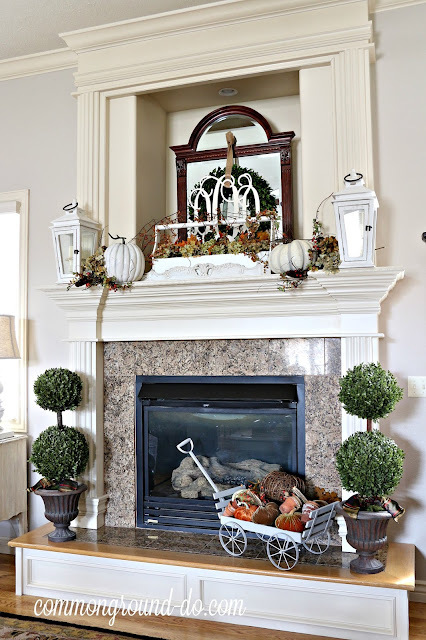 You always have the most wonderful fall decor...your vignettes are truly lovely! Everything looks so festive and beautiful. As always, you nailed it, Debra. Your house looks fabulous. Hugs. 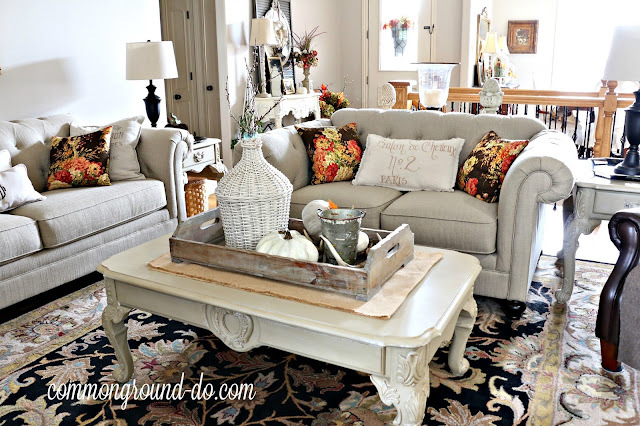 Love seeing your pretty home on this fall tour Debra. 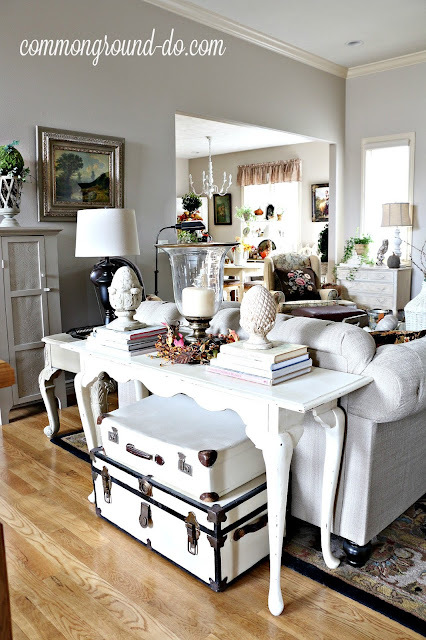 Just beautiful every room. 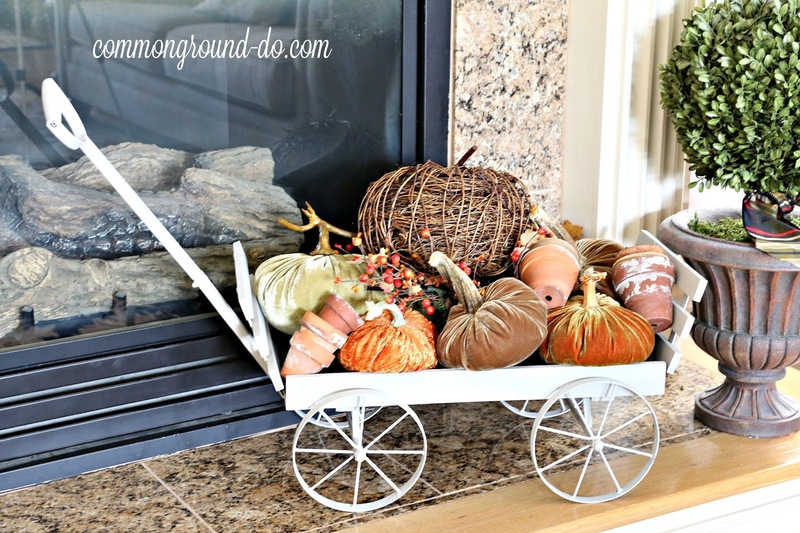 Love your white wagon with the pumpkins. Super cute. I always have loved your dark wood armoire. That piece is gorgeous. Happy Friday and have a wonderful weekend. 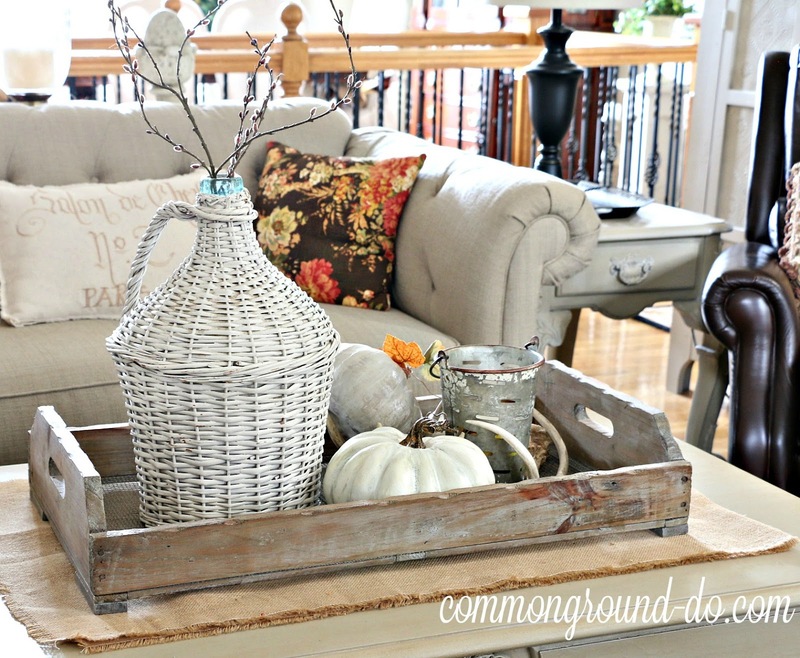 Love that little French wagon full of pumpkins! It's always nice to tour you home, so many beautiful details. 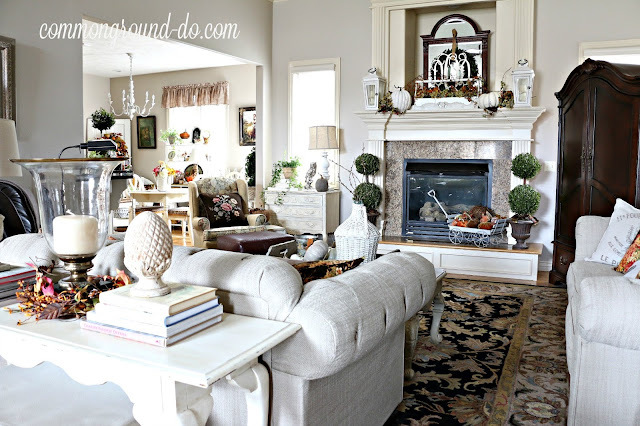 Your home is gorgeous and inviting. So much inspiration for fall decorating!! Can't wait to get started! Debra- hard to believe it's been 3 years in your new home. I remember when you packed it all up and moved. Thanks again for sharing your lovely fall home with the rest of us. Hard to believe you've been situated for 3 yrs now! Love your home, and can't wait to see that kitchen sitting area. It's my very favorite! Wow. You have the perfect amount of color in your beautifully styled neutral rooms. Love it all! What a beautiful home you have! 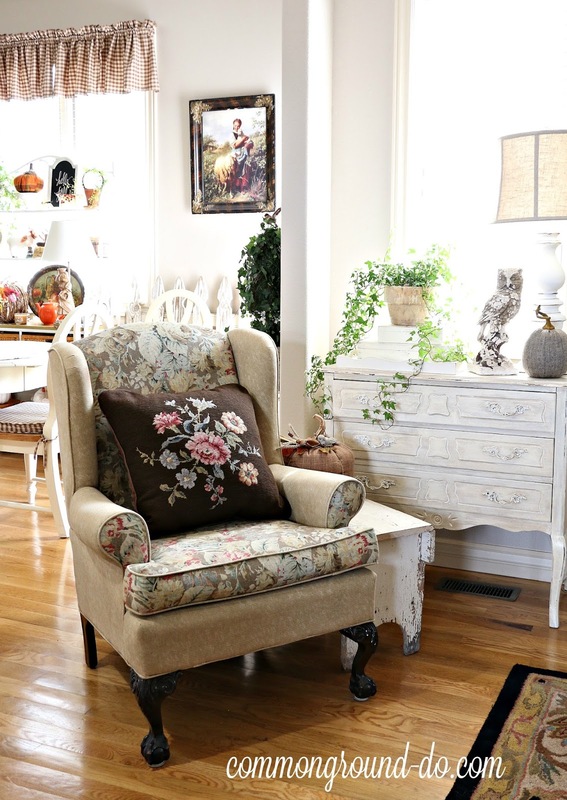 Your home always looks so pretty, Debra! 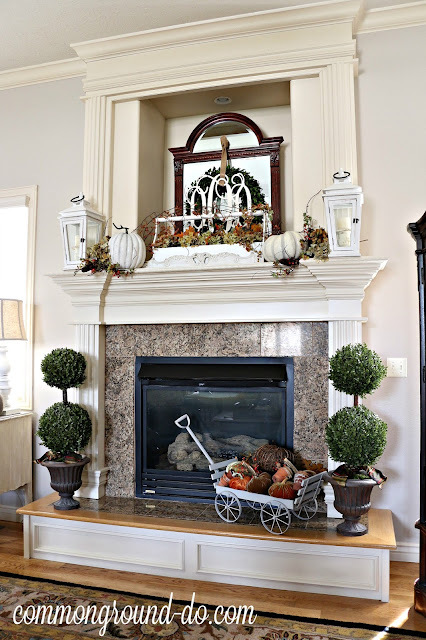 I really enjoyed seeing how you've decorated for Fall, and I will come back to see your kitchen! 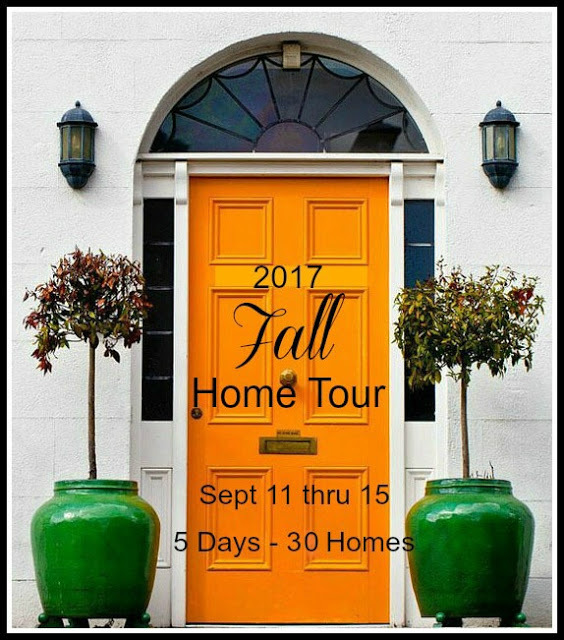 I'm late visiting your tour this year Debra hope you can forgive me, but I always look forward to your home tour no matter the season! Your home and decor is always so magnificent and of course, you did not disappoint again! Love it all! 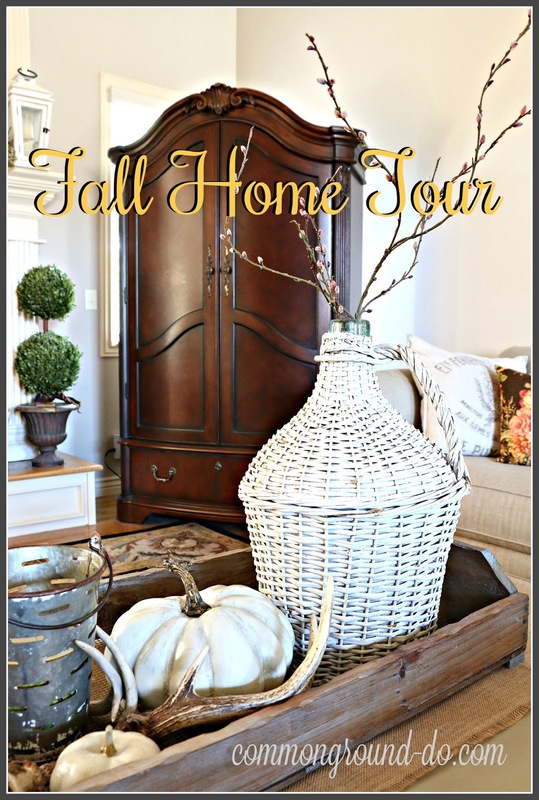 So honored to share this Fall home tour with you! Cheers!